The first applications of any new technology often do little to capitalize on its potentially transformative capabilities. Rather, new technology is first used to replicate its predecessor’s functionality—only afterwards do new possibilities begin to emerge. Such was the case with the earliest analog electronic pressure transmitters. An analog milliamp or low voltage circuit replaced the pneumatic signal, but the force-balance sensor mechanism of the previous generation pneumatic transmitter remained—complete with its drift-prone and maintenance-intensive moving parts. Only when the entire sensor and communications package was re-imagined from the ground up in 1969 did Rosemount Engineering Co. have the complete package of capacitive sensor and miniaturized electronics necessary to deliver the game-changing accuracy and stability performance of the Rosemount™ 1151 Pressure Transmitter. The company had cut its teeth in the mission-critical U.S. space programs of the 1950s and 1960s, and well understood the importance of delivering unwavering reliability in tandem with accuracy. Then as now, the oil and gas majors played a leading role in the acceptance and adoption of new process automation technologies. And when one of them placed an order for 1,000 of the Rosemount 1151 transmitters in 1972, it was off to the races. Rosemount—and Emerson—haven’t looked back since. Digital technologies—in the form of both onboard intelligence and bidirectional communications capability—were at the heart of Emerson’s next generation pressure transmitter, the Rosemount 3051. The new free-floating sensor itself was micro-machined, and custom state-of-the-art surface-mount application-specific integrated circuits (ASICs) set the stage for a new burst of digital innovation starting in the mid-1980s. While the Rosemount 3051 brought yet another level of operational stability and responsiveness to the company’s pressure instrumentation offering, it also marked a significant expansion in transmitter functionality beyond an accurate, stable pressure measurement output. In 1985, Emerson introduced its Smart Family of instruments, including pressure transmitters that communicated using the company’s Highway Addressable Remote Transducer (HART®) protocol, which was soon released to industry as an open standard, now supported by the FieldComm Group. The HART protocol allows pressure transmitters and other instruments to communicate with handheld devices and host control systems via a digital signal superimposed atop the transmitter’s 4-20mA analog process variable signal. Ultimately, HART was complemented by the fully digital protocols of FOUNDATION Fieldbus, Profibus and WirelessHART®. Most importantly, digital communications meant that the computational power now on-board the company’s increasingly capable pressure transmitters was no longer stranded at the end of a one-way street. 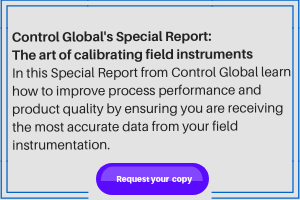 The first of this newly liberated information to be exchanged was device status and configuration settings, often only in the course of commissioning and calibration tasks. But once unleashed, the ability of these early-day “edge” devices to perform self-diagnostics and complex calculations based on multiple sensor inputs began to blossom—and continues to do so. One of those advances was the Rosemount 3095 MultiVariable™ transmitter. In 1991, Emerson received funding from what was then the Gas Research Institute to develop “the world’s most compact electronic flow measurement (EFM) device.” The Rosemount 3095 included sensors for static pressure, differential pressure (DP), and temperature, and also calculated derived quantities such as a real-time, temperature-compensated mass flow rate. All of this functionality was available in a device that was the same size as the standard Rosemount 3051 Pressure Transmitter. It also paved the way for increasingly integrated pressure, flow and level solutions to come. While many technological advances during the 1980s and 1990s continued to extend the scope and applicability of Emerson’s pressure measurement solutions, the 2001 launch of the existing flagship transmitter, the Rosemount 3051S (pictured), set yet another performance bench-mark for the process industry. With 0.025 percent accuracy, 200:1 rangeability and 15-year stability, the Rosemount 3051S was designed as a scalable innovation platform and has continued to allow ongoing developments in advanced intelligence and measurement. The exceptional performance characteristics of the Rosemount 3051S made possible Emerson’s Ultra offering due to superior dual-capacitance Saturn™ sensing technology, the hermetic SuperModule™ platform and advanced manufacturing techniques. As a result, the Ultra Performance Class is warrantied for 15-year operational stability. Emerson built upon this foundation in 2005 with the release of its DP flow meter adaptation, Ultra for Flow, which optimizes performance over a wide flow turndown. Performance is specified as a percent of reading instead of the traditional percent of span. Ultra for Flow supports up to a 14:1 flow turndown, maintaining better than a ±0.5 percent of reading specification over the entire operating flow range. The scope of the pressure transmitter’s diagnostic capabilities also took a substantial step forward with the Rosemount 3051S. An expanded list of device health diagnostics now encompasses not only sensor and electronics, but safety certified diagnostics for enhanced Safety Instrumented Systems (SIS), diagnostic and event status logs, and customizable service alerts. Also included are loop integrity diagnostics, which use the qualities of the electrical signal to detect issues such as water in the instrument housing, corrosion and other wiring or power supply problems. Perhaps most significant is the extension of pressure transmitter diagnostics from the device itself and associated wiring to issues with the process to which it's attached. Referred to as "Process Intelligence" by Emerson developers, this set of diagnostics is based on the real-time dynamics of the process variable itself. Patterns in variability are used to detect such diverse process issues as plugged impulse lines, flame instability, column flooding, pump cavitation, entrained air, process leaks and tank agitation loss. This entirely new class of pre-configured diagnostics is delivering a range of business results such as reduced maintenance costs (by focusing on devices that actually need maintenance), improved product quality (by identifying process optimization opportunities), increased uptime (by preventing abnormal conditions), increased throughput (by running closer to constraints) and reduced waste and rework (by preventing process upsets). Wireless networking technology, notably via the WirelessHART protocol, has extended the applicability of pressure measurement solutions by making incremental monitoring points far easier and more affordable to install. With the completion of the specification in 2008, Emerson rolled out a full range of wireless pressure, DP, flow, level and multivariable solutions that can be added at 40-60 percent of the cost of traditional wired instruments. Relatively new to Emerson’s wireless lineup is the Rosemount Wireless Pressure Gauge, a one-to-one form-factor replacement for traditional pressure gauges, which are based on Bourdon Tube technology—an antiquated mechanical sensor invented in the 1800s. The Rosemount Wireless Pressure Gauge not only represents a 10-fold improvement in reliability, but it provides wireless transmission of the monitored pressure back into the control room. This reduces the need to send personnel out in the plant to monitor these stranded measurement points, which improves personnel safety. Robust in design with multiple isolation barriers, the Rosemount Wireless Pressure Gauge can withstand over-pressure or burst pressure up to 11,000 psi (758 bar). Meanwhile, local diagnostic indicators go far beyond simple pressure indication. One blinks green, yellow or red to warn of unsafe conditions, and another warns of an over-pressure event, device malfunction or low battery. Similarly, a broad range of digital technology enhancements to Emerson’s Rosemount pressure measurement offering has provided a means to effectively communicate information to those who need it. A new breed of intuitive device dashboards, for example, are designed around users’ tasks, with 63 percent of use cases discernable at a glance. They include instant insight into device and communications status, device readings, shortcuts to most common tasks and recommended actions to help with troubleshooting. As important as digital technology has been to advancing the performance and capabilities of Emerson’s pressure measurement solutions, there’s also a case to be made for the role of mechanical innovation. That’s the subject of the next article in this special report. Mechanical innovations include pre-assembled solutions that are safer for workers and the environment as well as easier to engineer and install. It also entails unique flow elements that perform better, save energy and reduce installation complexity.